TMZ Sports is reporting that former NBA player and former husband of Khloe Kardashian was found unconscious and unresponsive at the Nevada brothel Love Ranch South. According to the Nye County Sheriff’s department, a call came in at 3:15 PM for an unresponsive male at the Love Ranch. It turned out to be 35-year-old Lamar Odom, who divorced Kim Kardashian in 2013 after four years of marriage. Paramedics treated Odom and he was taken to a nearby hospital. TMZ is updating that Odom is still in a coma and his heart is failing and their source says he is having serious problems with his kidneys and lungs as well. Lamar Odom is fighting for his life after falling into unconsciousness at Dennis Hof’s Love Ranch South in Pahrump, Nevada … TMZ Sports has learned. Sources at the Love Ranch tell us … 35-year-old Odom arrived at the Ranch Saturday and was partying with the girls for days. A source at the Ranch said Lamar was taking an herbal substitute for Viagra. We spoke with Hof … who tells us Tuesday afternoon, a woman went into Odom’s room in the VIP suites and found him unconscious. We’re told the woman began screaming for the manager — who called 911. This terrible situation should probably not come as a surprise as Lamar Odom has been on a downward spiral for years. Odom has been dealing with a drug problem for years and it looks like it may have finally consumed him. The grand daughter of Oscar award winning actor Morgan Freeman was murdered in New York City early Sunday morning. 33 year old E’Dena Hines was stabbed to death on the Manhattan sidewalks by her ranting and crazed boyfriend. Reports state Hines was stabbed 16 times.According to accounts, Hines’ 30 year old live-in boyfriend, Lamar Davenport, was in a drug-induced psychosis when he continuously stabbed her ranting, “Get out, devils! I cast you out, devils! In the name of Jesus Christ, I cast you out!” She was transported to Harlem Hospital, where she was pronounced dead. The granddaughter of acclaimed actor Morgan Freeman was stabbed to death on a Manhattan sidewalk early Sunday during what law-enforcement sources and witnesses described as an “exorcism” at the hands of her ranting boyfriend. He has six prior arrests, including for marijuana and petty larceny, the sources added. “The world will never know her artistry, and how much she had to offer”. Where are all the race hustlers … Black lives matter, right? Marion Barry dead at age 78. Marion Barry, the former mayor of Washington, DC has passed away at the age of 78. Hospital spokeswoman Natalie Williams said Barry arrived at the hospital around 12:30 a.m. and died at 1:46 a.m. He had been released from Howard University Hospital on Saturday following a brief stay. There was no cause was given, but he had suffered from many health problems over the years, including diabetes, prostate cancer and kidney ailments. Barry was married four times and is survived by one son, Marion Christopher Barry. Barry was first elected mayor in 1978, then re-elected in 1982 and 1986. However, Barry was probably most famous when he gained international notoriety in 1990 when he was videotaped in an FBI sting smoking crack in a downtown Washington hotel room with a female friend. He was convicted on one count of drug possession and sentenced to six months in prison. Unbelievably, after getting out of prison, Barry was elected to a fourth, and final, term as mayor in 1994. It probably spoke more to the disarray of DC than anything else. Former District of Columbia Mayor Marion Barry, whose four terms were overshadowed by his 1990 arrest after being caught on videotape smoking crack cocaine, died Sunday morning. He was 78. Barry D.C. council spokeswoman LaToya Foster says he died shortly after midnight Sunday at a hospital in Washington. He had battled kidney problems stemming from diabetes and high blood pressure and underwent a kidney transplant in February 2009. But he gained international notoriety in 1990 when he was videotaped in an FBI sting smoking crack in a downtown Washington hotel room with a female friend. He was convicted of a single count of drug possession — jurors had deadlocked on most counts — and sentenced to six months in prison. Despite the embarrassment, Barry’s political career was far from over. In 1992, he made it back to city government, winning a council seat representing the poorest of the city’s eight wards. That victory helped propel him to a fourth, and final, term as mayor in 1994. President Obama on Sunday paid tribute to the late Marion Barry, saying the former Washington, D.C., mayor and councilman made a mark fighting against poverty and spearheading other initiatives that earned him the respect of his city. Hunter Biden, the son of Vice President Joe Biden, has been discharged from the US Navy after testing positive for cocaine. Hunter, a lawyer and former lobbyist, was commissioned as an ensign in the Navy Reserve in 2013. The 42 year old Biden applied for a commission into the reserve as a public affairs officer. But because of his age, Biden needed a waiver to apply. The WAPO reported he needed a second waiver because of a drug-related charge when he was younger. Oops, wanna get away. It was not clear what type of discharge he received … I would like to think it was a dishonorable one. The Navy Reserve discharged Vice President Joe Biden’s son Hunter this year after he tested positive for cocaine, U.S. officials confirmed. The discharge of Biden, a 44-year-old lawyer and managing partner at an investment firm, was first reported by the Wall Street Journal on Thursday. He confirmed the report in a statement to CNN. “It was the honor of my life to serve in the U.S. Navy, and I deeply regret and am embarrassed that my actions led to my administrative discharge. I respect the Navy’s decision. With the love and support of my family, I’m moving forward,” he said. Biden was commissioned as an ensign in May 2013 and assigned as a public affairs officer in a Norfolk, Virginia-based reserve unit. A month later, he tested positive for cocaine, and he was discharged in February, according to the report. 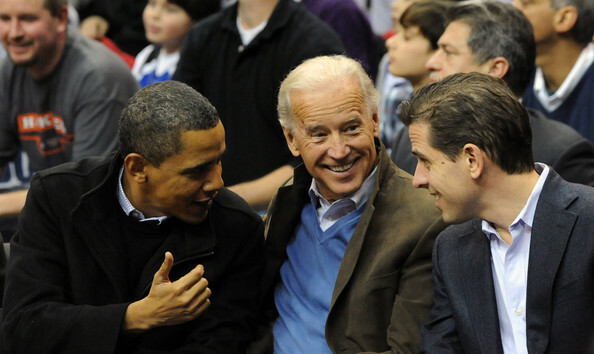 Joe Biden’s Son Hunter Was Kicked Out Of The Navy For Cocaine Use. He was discharged in February of this year.